The one-of-a-kind underground waterhole hide in front of the lodge (reached via a 65 metre long tunnel) is fantastic and allows some of the most up-close and intimate animal viewings you’re ever likely to enjoy - no need for zoom lenses and binoculars here! Guests consistently rave about the food at Mhondoro – in fact the comments from the predominantly foreign guests are liberally sprinkled with references to “Michelin restaurant quality” meals! The lovely swimming pool on the deck above the lodge waterhole features something almost unique and extremely welcome – it’s heated, making enjoying a swim here possible for a much greater period of the year! We love the Spa’s outdoor bath on the open deck overlooking the waterhole – if that soothing massage hasn’t relaxed you enough, enjoying a soak here should do the trick! the spectacular underground waterhole hide, reached via a 65 metre long tunnel, brings you virtually nose to nose with the animals as they come to drink at the waterhole! What a stunning transformation! The original Mhondoro was a pretty bland mid-range lodge that unfortunately burnt down back in 2015. 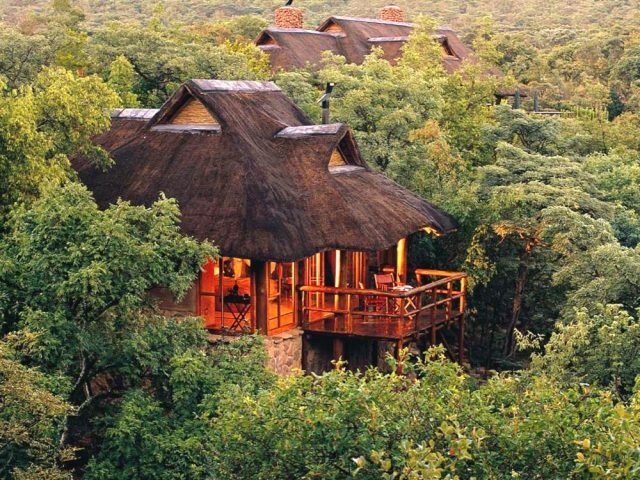 Perhaps the operative word should actually be “fortunately” because the new Mhondoro that emerged in its place is nothing short of sensational and has leapt right to the head of all the lodges in the Welgevonden reserve! 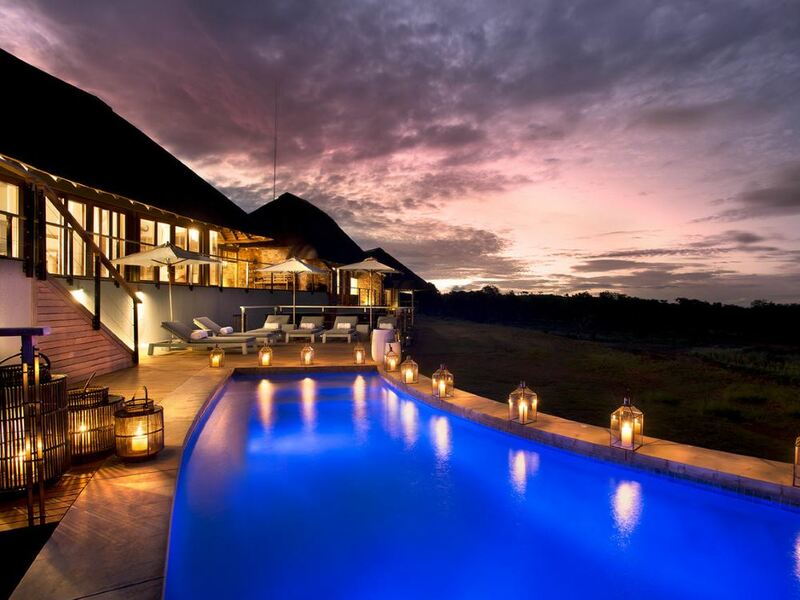 There are 5 superbly luxurious Suites at Mhondoro and frankly you’re in for a treat whichever room you choose – first up for couples there are 2 Deluxe Suites as well as a Honeymoon Suite which enjoys the most secluded position of all the rooms and also adds a heated plunge pool and day bed on its deck; then there’s a Family Suite with 2 bedrooms sharing a bathroom as well as a gorgeous lounge and dining area; the Executive Suite also boasts 2 bedrooms but these are both en-suite (and so suitable for 2 couples of friends) and there’s also a comfy lounge area complete with fire place to keep those chilly winter nights at bay! If you’re a family or group of friends travelling together though, it’s hard to look further than the spectacular Villa – a wonderfully luxurious 3-bedroom villa complete with its own swimming pool, gym and yoga room. Best of all though you’re pampered by your own dedicated team with a private chef and butler there to look after your every need. Naturally the villa also includes its own 4x4 game vehicle so you have true exclusivity and flexibility whilst out on game drive! With the rooms being undoubtedly the most luxurious of all the lodges on Welgevonden, it comes as no surprise that the main lodge facilities are similarly impressive. The lounge and bar/dining area exudes chic contemporary décor and design flair whilst still remaining welcoming, with comfy sofas to snuggle up in next to the fireplace. The large heated swimming pool on the main deck overlooking the active waterhole is a feature of the lodge, whilst a stunning Spa (complete with a bath on the open deck overlooking the waterhole) and a fully equipped gym cater for all energy levels. 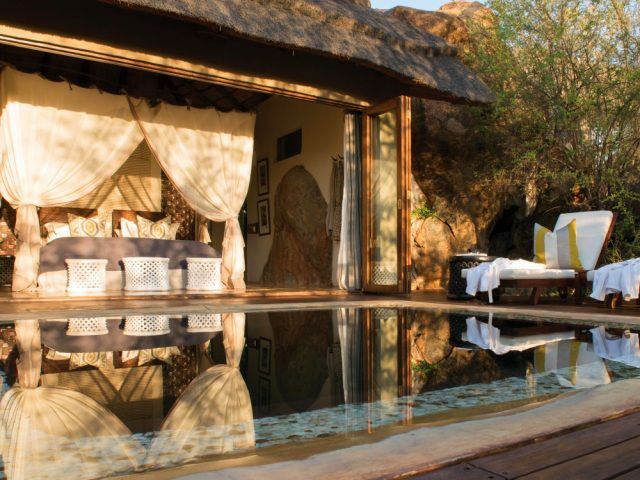 The signature feature of the main lodge at Mhondoro though has to be the spectacular underground waterhole hide, reached via a 65 metre long tunnel and which brings you virtually nose to nose with the animals as they come to drink at the waterhole. Forget those long telephoto lenses – you’ll need a wide-angle lens on your camera to fit the animals into the frame they’re so close! 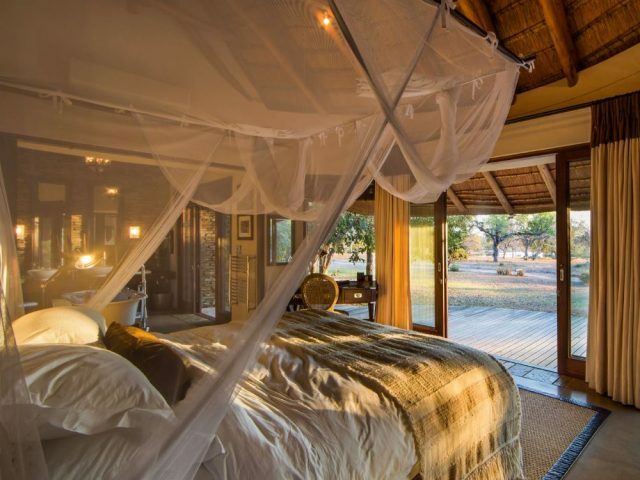 The luxury safari experience at Mhondoro isn’t confined solely to its lovely rooms and public areas though: outside lies a rich malaria-free biodiversity boasting plentiful game. 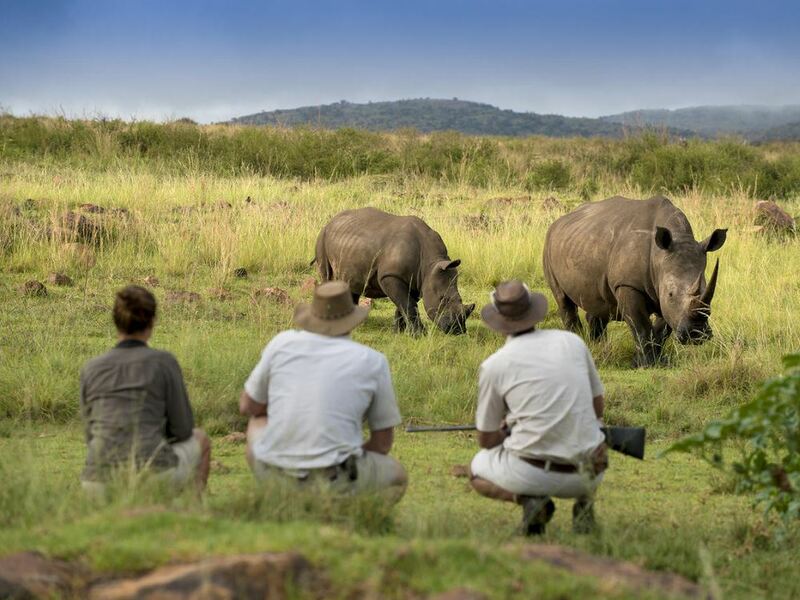 The Welgevonden doesn’t perhaps reach the heights of the greater Kruger reserves for example, but it remains a consistently decent Big Five reserve with over 35 000 hectares of traversing tucked between the blue mountains of the Waterberg. Note that unlike some other reserves, the delicate eco-systems of the Welgevonden don’t allow for off-road driving so you’re unable to career off into the bush in pursuit of lions or rhinos. Back at the lodge there are a couple of things that definitely deserve highlighting – firstly the superbly friendly service guests enjoy courtesy of the enthusiastic lodge staff; then there’s the stunning quality of the dining on offer at Mhondoro. Look at the guest comments which are littered with regular references to “Michelin restaurant quality” food - and a bonus is that the rate also includes drinks. Who knows – perhaps you’ll need a visit or two to the gym during your stay, just to keep that happy waistline from expanding too much from all the delicious fare on offer! Regret children under 6 years of age may not be accommodated on scheduled game drives when other guests are joining. Private game drives may be arranged for families with small children at an additional rate per game drive, subject to the availability of a vehicle and a ranger.